This EP just in from an alcoholic cowboy who thinks he’s an indian (The Native American kind); Big Chief. His first release, a cassette called New adventures in love-fi (released on the Big Chiefs Traveling Medicine show label) was a lo-fi folk record, but this EP takes a strange new path. The singing is inspired by people like Frank Sinatra and Scott Walker, but that really doesn’t shine through. The songs are about murder, and the simple instrumental melodies are fronted by reverb soaked drunken crooner vocals. 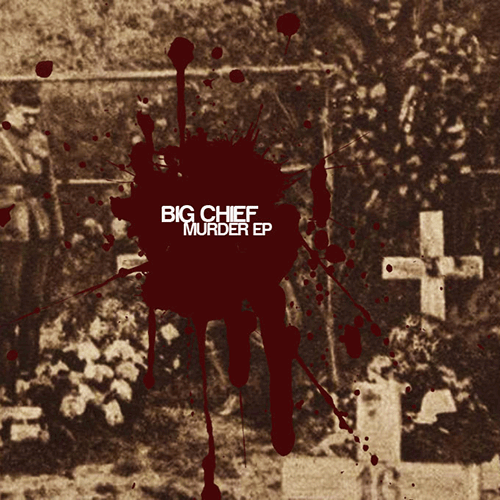 Murder EP is a taste of what’s to come from Big Chief. These seven tracks are written, recorded, performed and produced by Big Chief (unless otherwise noted), but the coming full length have contributions by (amongst others); Frank Benjamin Finger, Children and Corpse Playing in The Streets, Stefan Remen, Jakob Myhre and Andreas Lande to name but a few. Artwork by Morten. *1 The bassline is co-written with Ace of Spades. *2 Words and melody by Eri Myhrebonus and Big Chief, synth by Ace of Spades and Big Chief.